From my home office window, I can see my (modest) backyard grove of citrus….meyer lemons, persian & key limes, Louisiana sweet oranges, moro blood oranges, owari satsumas, tangelos, and a little kaffir lime tree. In mid-December, the trees are heavy with fruit. Satsumas and limes are nearly finished, the meyer lemons (pictured) are in full swing, and I eagerly await the sunburn-like, rusty-red flush on the blood oranges, signalling their full sweetness (usually by late January). This was a good year for citrus ’round these parts, thanks to regular rain in the late spring and early summer. 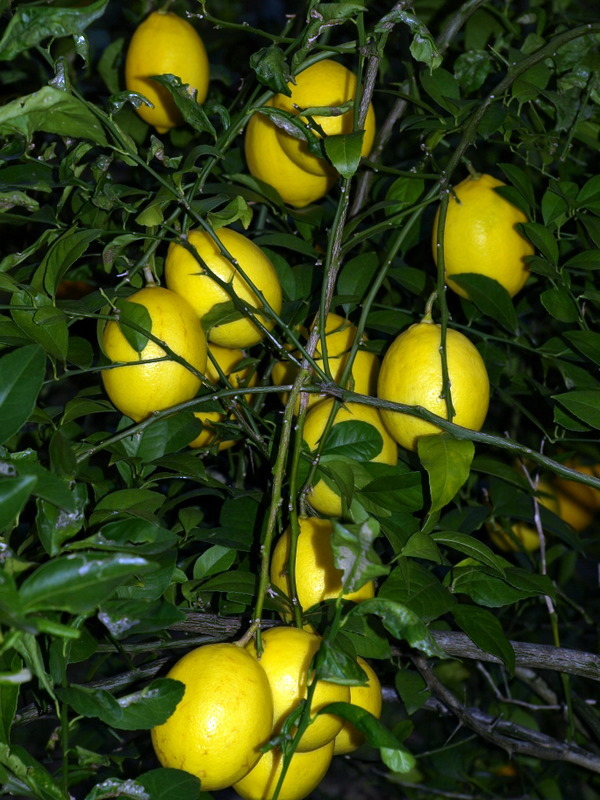 In fact, overabundant backyard production seems to be the norm this winter, and everywhere I go, friends and neighbors are trying to give away fruit…..and it always seems to be grapefruit. No one should ever plant more than one grapefruit tree, as it is the least-loved citrus and somehow manages to be the most prolific in our climate. My outdoor thermometer reads 70 degrees, and it’s only 10 am, so I’m mixing up a batch of frosty grapefruit chillers. It’s too warm for holiday nonsense like hot buttered rum, mulled wine or spiced cider! To tame grapefruit’s bitterness, I add a bit of sugar and plenty of fresh ginger, with a kick of mint to surprise the palate. In a pitcher or 4-cup pyrex measure with a spout, add sugar, ginger, and mint leaves. Muddle together for 45 seconds, pressing firmly with the back of a large spoon. 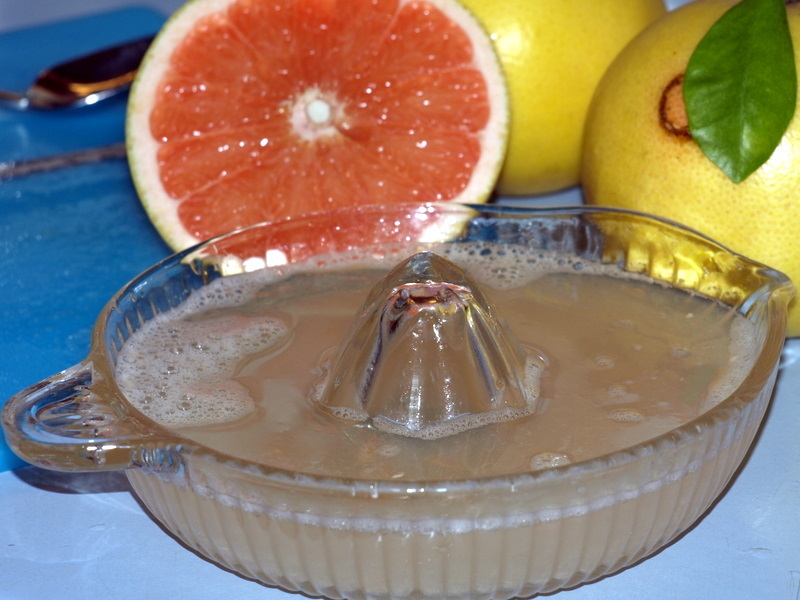 Add grapefruit juice and stir until sugar dissolves. Allow to stand for 15-30 minutes. To serve, pour over ice in a tall glass until half-filled, then pour in sparkling water to fill. I’m happy to take any Meyer lemons off of anyone’s hands. I’ve been sitting on a beautiful Meyer lemon tart recipe I’ve been dying to try for over a year now and finally have a Merry Christmas stand mixer and kitchen scale to (hopefully) pull it off. Just need 1 lb of gorgeous lemons. Will you be home today? Gotta go to Meyer the Hatter, can drop off some lemons if you’re up to making a tart. 1 lb of lemons isn’t much….these lemons are BIG.